Zakharova Larisa I.; ed. by Bekyashev K.A. The Textbook was prepared in accordance with the Federal State Educational Standard for Higher Education as applied to specialisation 40.03.01 “Jurisprudence” (Bachelor (degree) qualification) and the syllabus of the academic discipline “International Sports Law”, approved by the International Law Department of the Kutafin Moscow State Law University in January 2017. The Textbook consists of 17 chapters. They correspond to the themes of the syllabus of the academic discipline. In its General part, the history, object, subjects, sources, special principles of international sports law, the process of regulation of international sports relations at the universal level within the framework of the United Nations, its specialised agencies and programs, at the regional level within the Council of Europe and the European Union, at the bilateral level are considered. The Author makes a corresponding distinction with the object, subjects, sources, special principles of lex sportiva, a set of corporate norms elaborated by the International Olympic Committee, the International Paralympic Committee, international and national sports federations. Special attention is paid to the study of ways of resolving sports disputes through arbitration and appeal proceedings in the Court of Arbitration for Sport (CAS), by means of judicial proceedings in the European Court of Human Rights (ECtHR) and the Court of Justice of the European Union (CJEU). The Special Part of the Textbook identifies problem areas that require additional efforts to implement international legal and corporate regulations: the use of doping in sport, violence and hooligan behaviour of spectators and fans, environmental protection when organising international sports competitions, economic crimes and discrimination in international sports, protection of property rights with regard to television and radio broadcasts of international sports competitions, the use of Olympic symbols, countering threats to a healthy lifestyle. International instruments and acts of the Russian legislation are as of May 2018. 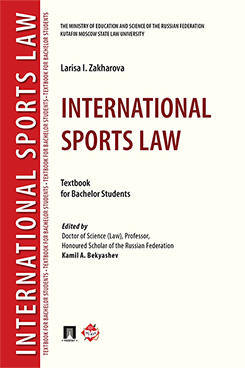 The Textbook will be of interest for Bachelor students of law, lecturers of higher education institutions, practicing lawyers, staff members of organizations of the Olympic and Paralympic movements, as well as for all those whose academic interests and practical activities are connected with international law, sports law and lex sportivа.